The lovely Joe Dale sent me the link to this video on Teachertube today – thought I might find it interesting. And I did, so I thought I’d share it with you too. 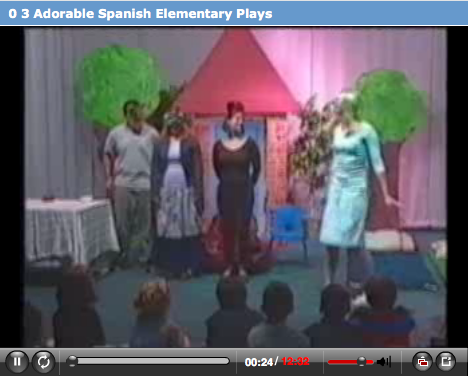 High School Spanish students perform The Three Bears, Snow White, and Little Red Riding Hood plays for area elementary students. The sound isn’t brilliant but the idea is clear – older pupils have worked on a play to present to younger pupils from neighbouring schools. This is an idea for transition that I love. It benefits both groups of pupils – excellence and enjoyment, anyone? The older pupils get to plan script practice and perform the play, using language they know and also stretching their vocabularies; the younger pupils are familiar with the story so don’t need to understand every word to be able to follow the plot. Both groups have fun, and links are made between the Key Stages, making ‘moving on’ easier for pupils – and potentially for their teachers too. It’s good to see what can be done with a bit scenery, imagination and a good smattering of Spanish!